Foursomes, Sponsorships & More Now OPEN! Good things are happening at Mid-Valley Claims. We had a most informative presentation by our own Beth Ossino on the latest in the Cannabis Insurance markets at the March meeting. We’re excited about our next couple of speakers, and looking forward to the revitalization of the MVCA Golf Tournament June 27th! please note the THURSDAY Date! A big thank you to Beth Ossino, Vice President and Claims Manager for Golden Bear Insurance, who stepped-up last minute to present for the group the latest on Cannabis Markets and Claims at the March meeting. We had a last minute change as our scheduled speaker, Christine Reed, from Low Ball & Lynch, had an unexpected schedule conflict. I’m happy to report Christine has rescheduled with us to conduct the annual Fair Claims Settlement Practices Regulations recertification. Please note that the change of date for that event. 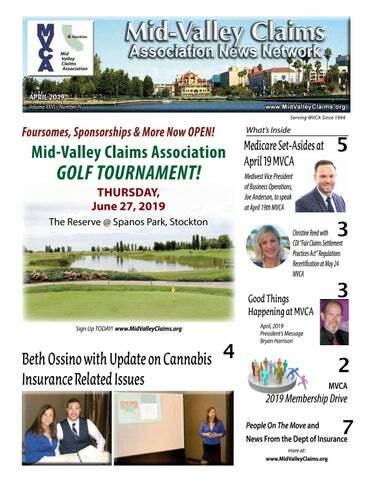 We are moving it to May 24th, instead of the normal third Friday, in consideration of the Sacramento Claims Association’s Golf Tournament on the 17th. Beth provided a lot of information about insurance markets as they relate to the cannabis industry. From coverage for growing, property facilities, to Liability coverage for dispensaries, there is a lot to be considered. Golden Bear, she stated, is the only mainstream carrier insuring these markets thus far. For our April 19th luncheon, we are pleased to welcome Mr. Joe Anderson, from Medivest, who will give a presentation on Medicare Set-asides in various capacities. Beth Ossino, with Nathan Williamson, a local New York Life Gallo Claims Department folks as well as Truex Insurance, Thomas Shefchick Agent, and her son. Engineering, and Western Appraisers were all in attendance. Joe is a frequent speaker on MSP compliance across the country. He has developed a special focus on integrating MSA’s with Special Needs Trusts as well as Medicare compliance in the ever-changing liability arena. His presentation promises to help you customize strategies to build into your future medical settlement planning. Medivest is a leading provider of Medicare Secondary Payer (MSP) compliance solutions to the workers’ compensation and general liability industry. Medivest has been administering medical custodial accounts since 1996, and in 1998, was the first to professionally administer a Medicare Set-Aside Arrangement. Medivest has been a persistent innovator, creating solutions (such as the MSA SelfAdministration Kit and MSA Trust Advisor Services) that address a variety of MSP and settlement issues. Medivest offers a wide array of products and services that make it the most competent and comprehensive source for MSP compliance solutions in the industry. As a leading provider of products and services that assist settling parties remain in compliance with Medicare Secondary Payer obligations including custodial accounts and Medicare Set-Asides (MSAs), Mr. Anderson has spent time working for a national structured settlement planning firm dedicated to providing analysis, design and implementation of periodic payment packages in the resolution of personal injury and wrongful death litigation as well as innovative attorney fee structures relevant to class action, taxable damages and other non-traditional structured settlement cases. Additionally, Joe has worked for a national insurance carrier underwriting commercial risks including a top 5 account for the western region. He received his degree from the University of San Francisco as a student-athlete with a major in Sociology and minor in Psychology, earning him induction into the Alpha Kappa Delta International Honor Society. Joe is also a member of the International Association of Insurance Professionals (IAIP). Join or Renew your MVCA Membership Now! BOLIN & MARCEE LAUNCH CITY WATER CONSERVATION, INC.
revealed important findings on diversity in the industry. The Department’s surveys have seen procurement between insurers and California’s diverse-owned businesses increase by 93% over a five-year period, from $930 million in 2012 to $1.8 billion in 2017. SB 534 will reauthorize the Insurance Supplier Diversity Survey, which expired in January 2019, and expand it to include LGBT- and veteran-owned businesses. In addition SB 534 will continue the Department of Insurance’s governing board survey and extend the Insurance Diversity Task Force, comprised of up to 15 members representing insurance companies, experts in supplier and governing board diversity, and minority, women, disabled-veteran or veteran, and LGBT business enterprises. and property damages to liability, and even the industry’s “cashonly” policy causes hurdles with which to deal. Given the lack of Federal acquiescence to the legalization of even medical, let alone recreational, cannabis use, the industry remains on an all cash basis for the time being. Beth is available to speak to groups on this topic. 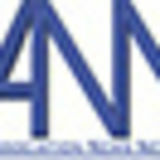 TO: Association News Network, Inc.